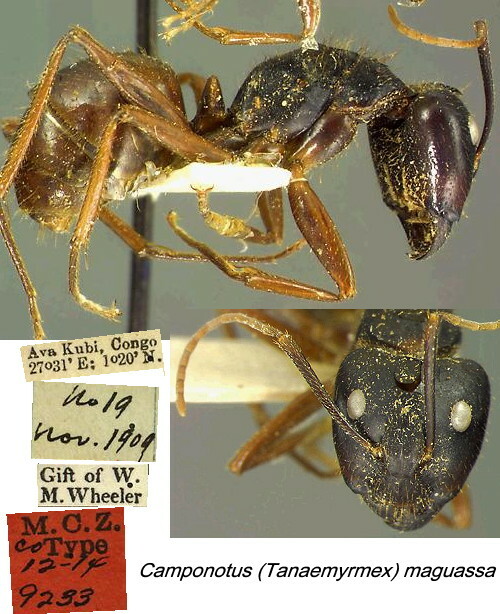 Type location Zaïre (Camponotus (Myrmoturba) maguassa new species, Wheeler, 1922: 237, soldier & worker); reassigned to Tanaemyrmex by Emery (1925b: in Bolton, 1995) . MAJOR WORKER - TL 9 to 10 mm, Head rather small, subrectangular, as long (1.3 mm. without the mandibles) as broad, a little narrower in front than behind, with straight posterior and very feebly convex lateral borders. Eyes rather large and convex, situated about their length from the posterior border when the head is seen from the front. Mandibles moderately convex, coarsely 6-toothed. Clypeus sharply carinate behind, rather deeply emarginate on each side of the median lobe, which is short, with straight border, distinctly dentate at the corners. Frontal area subtriangular, indistinct behind; frontal groove pronounced; frontal carinae approximated anteriorly. Antennae slender, the scapes straight, terete, not enlarged at the tip?, reaching about two-fifths their length beyond the posterior border of the head. Pronotum flattened above, its sides distinctly marginate anteriorly; mesonotum evenly arched in profile; metanotum indistinct; propodeum with subequal base and declivity, both surfaces straight and sloping, meeting at a rounded obtuse angle. Petiole rather high, oval when seen from behind, in profile with flattened anterior and posterior surfaces, its superior border rather sharp and entire. Gaster and legs as usual, hind tibiae nearly cylindrical, only very slightly compressed, without a row of bristles along their flexor surfaces. Body subopaque, the petiole, gaster and legs more shining. Mandibles coarsely and sparsely punctate, their tips striated, their bases sharply shagreened. Head very densely, evenly and finely punctate, so that it appears granular; the clypeus, cheeks, front, and vertex also with large, scattered, irregular, piligerous punctures. Sculpture of the thorax like that of the head but finer (especially on the pleura); the dorsal surface with coarse, sparse, piligerous punctures. Gaster finely, sharply and transversely shagreened, with coarse, sparse, transverse piligerous punctures. These have minutely papillate anterior borders so that the coarse hairs seem to rise from small projections. Legs finely shagreened or coriaceous. Hairs fulvous red, coarse, erect, rather abundant, long on the dorsal surface of the head, thorax, and gaster, somewhat shorter on the gula and petiolar border, still shorter but suberect on the cheeks, scapes and legs. Pleurae, anterior and posterior surfaces of petiole hairless. Pubescence rather coarse, very sparse, visible on the cheeks and gaster. Brownish black; funiculi, tips of scapes, legs, including the coxae, petiole, and gaster rich castaneous, the legs and funiculi slightly paler. The photomontage is a cotype major of from Zaïre on the MCZ, Harvard University, website at - MCZ link. Minor - Length 5 to 7.5 mm. Differing from the major worker in the shape of the head, which is longer than broad, with straight, parallel sides and broadly convex posterior border. The eyes are more convex, the antennal scapes longer, extending somewhat more than half their length beyond the posterior corners of the head. The clypeal lobe has more rounded corners. Described from numerous specimens from two colonies taken at Avakubi (Lang and Chapin). 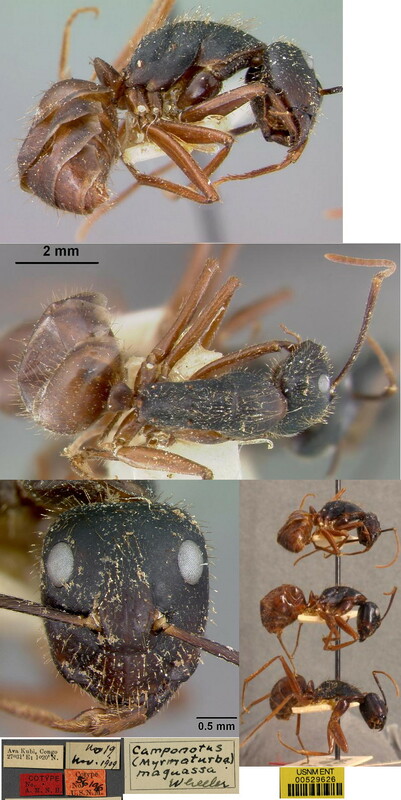 According to a note accompanying one lot, "these ants are said to be common in the forest in the decayed wood of large trees. Native name 'maguassa' "